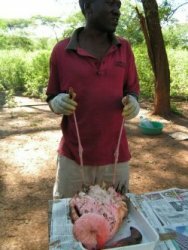 There were 4 parts to this research module: counting flamingos, counting and categorizing dead flamingos, conducting flamingo autopsies and counting Spirulina. 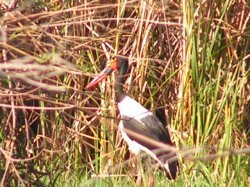 Additionally, for fun and interest, we went bird watching around the campsite and up at Kibkiritich where there is a fresh water lake. Flamingos are an odd lot. If you frighten one, you end up frightening a large population. That’s just the way they are wired. Since the flamingos don’t have any natural predatory defenses and have brains the size of grapes, they have evolved to mimic one another and to always stay together in large groups. Safety in numbers as the saying goes. If one turns its head to the right, the others around it do the same. If one moves forward or begins to take flight, the others follow suit, whether they are aware of any imminent threat to their individual selves or not. That saying about lemmings running off the cliff should really be replaced with one about flamingos. Perhaps this odd behavior can be attributed to paranoia? 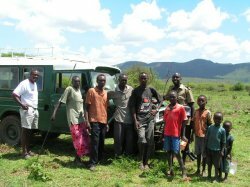 But James, one of our Kenyan drivers and part-time assistant researcher, believes that the birds are quite smart. He was explaining that if you add or place a boulder in an area where they regularly frequent, that the birds won’t go near that area until enough time has passed that they feel there is no danger. In fact, when they need to trap a bird to tag or conduct tests, the nets must be placed in the water well in advance. Regardless of whether one thinks the flamingos are neurotic, paranoid or smart, their group and mimicking behavior are probably the primary reasons that the species still exists. In the past 40 years, the Lesser Flamingo population has experienced significant die-offs. Once numbering around 2MM, the population has now been reduced by half. 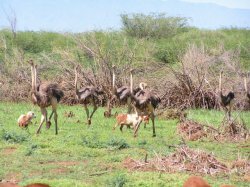 As mentioned earlier, there are several possibilities attributed to this die off: starvation, Avian tuberculosis, parasites, toxic algae and at Lake Nakuru, heavy metal contamination. On the first day of this module, Elfree, Timothy, James, Pavla and I started at the south end of the Lake and began to visually count the flamingos. Each person counted individually, using their binoculars or the telescope. The counts were recorded and an average was calculated. Though I understand the importance of recording the population, I did not agree with the methodology. By the time we traveled from the south to the north end, approximately 3 - 4 hours had elapsed. 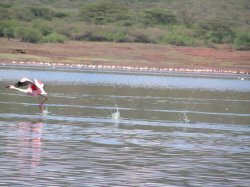 The flamingos were on the move all that time due to a variety of reasons and more were migrating in from Lake Nakuru. Therefore, in some places we over-counted, others, we under-counted. Also, our counts were all over the board. The differences were at times were extreme; a 100% differential was, unfortunately, not surprising. The only thing that was consistent about the counts is that we were inconsistent. 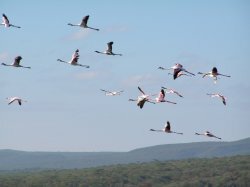 Though I realize that we are constrained by budget and therefore, it is not feasible to take a weekly aerial shot to count the number of flamingos, I would like to see other counting methods employed to reduce the variability. 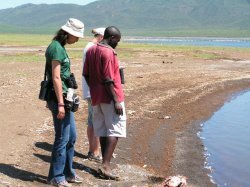 The following day, the team recorded the number of dead flamingos and ascribed Category 1 through 7 to the bodies, which described the state of decomposition. “1” was recently died, eyes not glassy, body plump and whole, no discernible reason for death. “7” was nothing but bones left. For each dead bird, we recorded the GPS reading and the category. 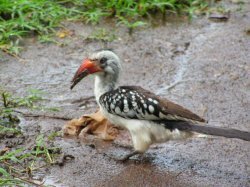 Quite a few died from being attacked by Maribou Storks, hyenas and baboons as evidenced by entrails strewn about or by limbs being torn off, leaving a pile of feathers. Though I didn’t get the final count, I think that we must have recorded at least 75 birds that day, many of which were Category 1. We also picked up two Category 1 one birds to take back with us to conduct post-mortem examinations later that afternoon. Timothy conducted the autopsies and Elfree and I recorded the results. I felt that I was back in my 7th grade Biology class, dissecting a dried frog. It was not a disturbing activity, but rather, quite fascinating -- and smelly. I breathed through my mouth. Elfree kept changing locations, always trying to keep upwind. We conducted 3 additional autopsies the next day. This time, Anderson Ndeke performed as the lead, Timothy assisted, as did two other Kenyans, Gabriel and Albert. Elfree and I were relegated to recording. By the time the 3 autopsies were concluded, I felt I could have performed them without too much difficulty. After all, it didn’t take the skill of a neurosurgeon, it wasn’t all that different from gutting a fish or cleaning a chicken, and it wasn’t like I’d have to be that careful since the “patient” was already dead. The tools were simple: a single scapel, 2 pair of surgical scissors, a couple of balances (for weighing the birds and its organs), some plastic containers for samples and a measuring tape. 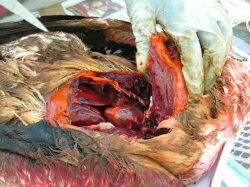 The autopsy initially consisted of visual checks, external body measurements of the lower leg and wing, and capture of any parasites. Then, a small incision on the breast was made to ascertain how much subcutaneous fat was present. The bird was weighed with a balance by placing the hook through the nostrils. 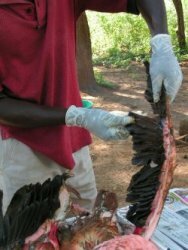 The chest was plucked and breastbone plate was located. Three cuts were made around the plate in order to crack the cavity open. A gloved finger was run around the edge of the cavity to loosen the internal organs from the body. 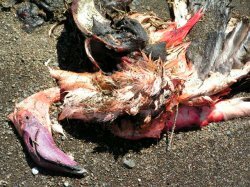 Interestingly, the insides of a flamingo had this glowing orangey-red color. Apparently, that’s normal. The fat, too, wasn’t yellow as I’d expected, but also was tangerine-orange in color. 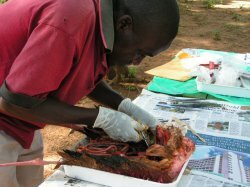 Samples of the lung, kidney, heart and feces were taken and would be sent to the lab in Nairobi for analysis. We measured the spleen, described the intestines and opened the gizzard and stomach. Most of the flamingos had gizzards crammed full of sand with no evidence of Spirulina. This was unusual, but the birds had plenty of body fat so starvation was ruled out. 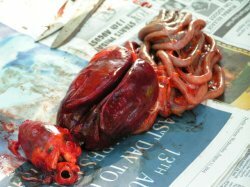 A few of them did have worms in the intestines and feces, which may have been the cause of death. After we finished with the internal organs, the head was unceremoniously sniped off so that the windpipe could be inspected. Next, Anderson sawed open the cranium and extracted the brain. It was then weighed and placed in a container for further analysis. The autopsy was concluded. 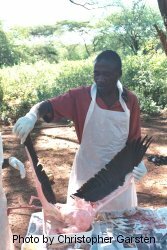 In the past 2 years that Anderson has performed flamingo autopsies, the vast majority of the deaths of these Category 1 birds have been attributed to avian tuberculosis. Pavla is conducting research on Spirulina. She is collecting data on Spirulina concentration in the water and trying to understand why Spirulina comes in loosely coiled (think stretched Slinky) and tightly coiled (compressed Slinky) forms. I’m not exactly sure what she is trying to prove, but perhaps she’s trying to make a link between the Lesser Flamingo population and /or lake health and the coiled forms. I surmised that the loosely coiled and tightly coiled forms are nothing more than chemical bonds breaking down, but that’s just a guess based on my limited chemistry background. On the day we analyzed lake water samples for Spirulina, Pavla collected a sample at surface level and at 5 cm below the surface. We used a photospectrometer to measure light absorption at various nanometer calibrations. After that, we created a couple of slides to count the number of loosely and tightly coiled Spirulina. Spirulina is the primary food source for the Lesser Flamingo. It is also the source of the birds’ pink color. The popular theory that the Flamingos get their color from eating shrimp or other crustaceans is false. This theory is further debunked as no shrimp live in the soda lakes in which the flamingos get their food. However, it is possible that diatoms or chironomid larvae or pupae which are found in the lake contribute to the pink color but no one here can rule those in or out at this time. On day 4 of this Birds project module, we were treated to a trip to Kibkiritich. Kibkiritich is an area within the Reserve, about 14 km upland from the campsite. It has a fresh water lake, and many dozens, if not hundreds of bird species. This is one of Timothy’s favorite spots. On the way there, we drove through several small villages. The landscape was very dry and rocky and the soil reddish. 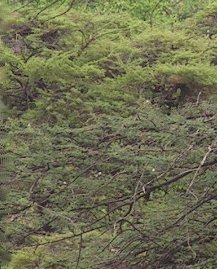 Acacia trees and shrubs dotted the landscape. Children of all ages were walking to school in their uniforms. The girls were dressed in pretty gingham dresses with white collars. As they spotted Elfree and me, though many just stared, the others had wide grins on their faces and shouted, “Hello! Hello!” or “Sweet? Sweet?” holding their hands out, palms up. The shops, the few that I saw, had both walls and roofs constructed out of corrugated metal. I can only imagine how hot it must get inside. It reminded me of an African movie that I recently saw whereby young students were punished by being sentenced to stay in a small metal hot box out in the hot sun. Many of the homes were shaped like yurts and made of natural materials. The walls were constructed of branches lashed together and roofs were made of grass, cattail reeds or straw. Some of the people packed their walls with mud - a good way to keep out insects, snakes and scorpions and to create a cooler interior space. Fences consisted of piles of dried, thorny Acacia branches. One of the researchers told me that the Acacia was the original inspiration for barbed wire. The fences were used to keep the goat and sheep herds in, and the predatory animals out. While in Kibkiritich, we met 3 farmers who were going fishing for talapia and catfish. They had long metal spears and gave us a quick demonstration how they hunt. Like most locals, they are living a life of subsistence. They raise a few cattle for meat and grow a few beans. They can eat a few wild plants as well. 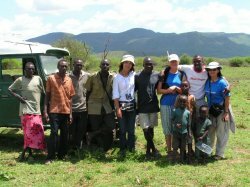 There are no government-built irrigation or water lines here; hence, agriculture is difficult in this arid land. All of their fresh water comes from the lake or collected in containers when the rain falls. 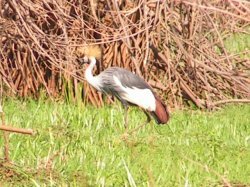 We saw many different bird species: Saddle-billed storks, Spotted Wood Doves, Common Sandpipers, Sacred Ibis, Great Egrets, Yellow Wagtails, Pied Wheatear, Rock Martins, Red-chested Cuckoos, Ostriches, African Crowned Cranes and the list goes on. Both Timothy and Gabriel performed their birdcalls and even did little dances to our amusement.